We all have chores that have to be done just to keep life running smoothly. And I’m sure we all also have things that are on some sort of wish list, things that may not be necessary but which we’d really like to see done. What I’ve figured out recently is that sometimes those wish list items just need to wait until the right time, when I really feel like doing them. Over the recent spring break I did a few of those, most notably pruning some branches that were impinging on the walkway and hence potentially jeopardizing the eyes of any visitors. I’d debated how to do these without making the trees look funky. I procrastinated. I decided that folks could just be careful. I dithered. Then one morning during break I thought that I’d really like to give it a try. The results have been spectacularly wonderful and I feel good about my efforts. 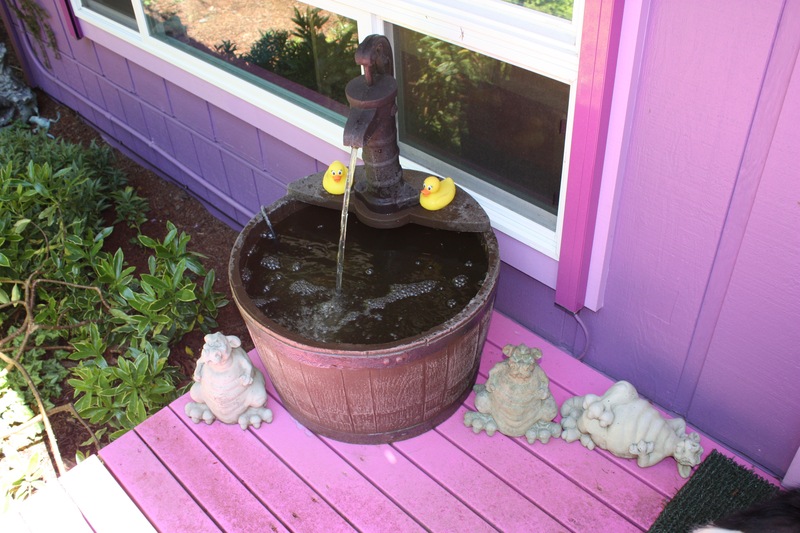 I’d wanted to get the fountain by the front door flowing better and I had a birdbath that really needed to be leveled. These tasks sat in the back of my mind, but nothing happened. Then yesterday, as I was rearranging items in the garage so that I can store things for a friend, I came across part of my old shower base, a beautiful green diamond, that is no longer needed because my shower now has a lovely and more practical red concrete floor. For those who may be new to my blog, I do have an outdoor shower. Anyway, I needed to move it and was surprised to find that it wasn’t as heavy as I’d feared. 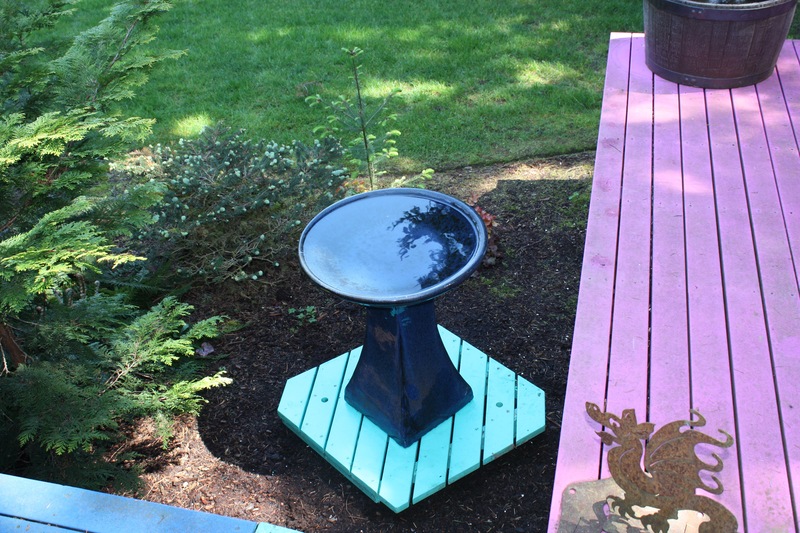 Then I got to thinking that it might make a very nice platform for the aforementioned birdbath to sit on, making it much easier to level. I was excited about the idea and so this morning I did just that. I took the diamond out of the garage and placed it in my backyard, got it level, moved the birdbath on it, and filled it. It looks wonderful, and here’s a photo of it. My final task was to finish my project at Camp NaNoWriMo. Last year I wrote and published three novels. I wrote the first draft of each during either the two Camp NaNoWriMo’s (April and July) or the full blown NaNoWriMo (November). I’ve decided not to do that again, as it was an unbelievable amount of work. Once was enough. But I enjoyed my Camp NaNoWriMo experience so this year I’m going to learn more about my characters by doing character sketches during my camp time and setting my word count at a gentler level, namely 30,000 words. Today I finished my first camp session with 30219 words. I didn’t write every day. I went at a pace that worked, writing when I felt inspired and had the time. And it worked. If I had a garden, I’d ask you to come over and make it pretty. Congratulations on your accomplishments…in writing and gardening! Thanks so much, Diane, and I’m really enjoying your blog! Have a lovely day! Good to catch up again. I seem to have been so busy I have not had time to look in. Must things back in perspective! Love the fountain.